The Ocean Engineering Division at the Naval Command Control and Ocean Surveillance Center RDT&E Division (NRaD) has developed and fielded two successive untethered, supervisory controlled UUV systems: a prototype, and an improved model. These robotic vehicle systems were part of the Advanced Unmanned Search System (AUSS) program which had its genesis in the early 1970s. At that time the idea of performing useful work with untethered robots in the deep ocean was met with some skepticism. Because of this program and the verity of these two vehicles, especially the improved one, we now know that supervisory controlled systems can be employed effectively. A systems engineering approach was applied to the design and construction of the prototype. Nevertheless, it was only after the prototype was fielded, many lessons were learned, and the prototype experienced major evolutionary changes that system feasibility was fully demonstrated. By that point the prototype had become outdated. As a consequence of the prototype experience, the improved model was developed with confidence. The second system was a complete redesign, using state-of-the-art subsystems and technologies. The resulting product was both capable and reliable, yet flexible, creating a plethora of system evolutionary possibilities. Sea tests, improved tactics, and systems engineering became synergistic and interactive. Increases in vehicle autonomy enhanced the human operator's capability to supervise by decreasing piloting and navigating burdens. The resulting system significantly exceeded expectations, and was delivered to the fleet. AUSS involved pioneering research in underwater search and in UUV systems. Important knowledge was also gained in systems analysis, system engineering, and program evolution. Invaluable experience was gained from 114 successful untethered dives. The purpose of this paper is to share many of the lessons learned during the AUSS program. The Advanced Unmanned Search System (AUSS) program was born in 1973, after the searches for the submarines USS Thresher and USS Scorpion, and an H-bomb search mission near Spain provided evidence that a need existed to improve the U.S. Navy's capability to conduct deep-ocean search. The first action on this program was to collect the people who were involved in these missions together with other search experts to discuss how to improve deep ocean search. This study group identified and documented several deficiencies in the existing state-of-the-art search approach. The study group, in total and in part, continued to participate and contribute to the effort until 1976. AUSS program evolutions encompassed a search data base, computer modeling of search, subsystems evaluation, the test-bed prototype search system, and finally the improved delivery system. Throughout this effort, from 1973 until 1993, engineers at NOSC (now NRaD) continued the AUSS program, acquiring experience and applying their knowledge to improve both search technology and vehicle technology. Many of the deficiencies flagged by the AUSS study group were related to the tow cables and tether cables used by undersea vehicles in the search mission. These deficiencies included long search vehicle turn time, vehicle navigation error, and vehicle control error. Attaching a long tow or power cable to a small vehicle cripples its potential maneuverability, slows its advance speed, drastically increases its turn times, and relegates primary vehicle control to the forces transmitted from the massive surface platform through the cable. The focus of the AUSS program became finding a means to decouple search vehicles from the effects of cables. After analysis, modeling, field testing, and candidate systems tradeoffs, it was concluded that the most effective approach to solving this problem was to develop and field the technology which would eliminate the cable completely. Cables and tethers have historically been the most troublesome component of underwater systems. They twist, tangle, chaff, break, blow up, fatigue, and can even entomb the attached system forever if snagged on the bottom. Nevertheless, many are more comfortable with a tether attached to an expensive underwater system, even though it means a loss in performance. But consider the AUSS experience. Two systems have been built and fielded which in combination have experienced 114 untethered launches (and 114 successful recoveries) to depths between 2500 and 12,000 feet. Like a faithful hound which can be trusted to come when called, AUSS proved it didn't require a long, clumsy, and potentially dangerous leash. AUSS program systems tradeoff studies and analysis showed that an untethered search vehicle with supervisory control outperformed all other tethered, towed, and untethered options. Fortunately, NRaD engineers were concurrently inventing the underwater acoustic communications capability which would make the cable unnecessary. Potential strengths of properly designed untethered systems are agility, stability, hovering in three dimensions, high forward speeds, rapid turns, combined with low risk of loss. Untethered systems, however, will not have enough self intelligence in the foreseeable future to replace the human decision making capability afforded by vehicle/operator communications. The human operator, when allowed to supervise the operation of an untethered system, fills in where the untethered system is deficient: in complex decision making. The human plans the mission, and decides how to alter the mission based upon information obtained from both the support ship systems and the vehicle itself. The human analyzes vehicle sensor data, and decides which anomalies in the data are of interest to the mission and therefore deserve further investigation, and which are not. He can also alter the tactics pursued by the vehicle based upon environmental changes indicated in sensor data. Finally, the human operator is uniquely qualified to declare when the mission is completed. Autonomous systems can profit by the inclusion of a real time (cable or fiber optic) or near real time (acoustic) communications capability during development testing. With this approach, the developers/operators have an opportunity to interact with the system and monitor system performance in real time while they work out system bugs. More autonomy is allowed as the system earns it. The evolution toward more autonomy with an untethered system can be carried to completion if the mission permits. The AUSS mission was not such a mission. Underwater search and inspection are too complex and too spontaneous for unsupervised machines; these tasks require human judgment and curiosity. Increases in AUSS vehicle autonomy have enhanced the human operator's capability to supervise by relieving him of piloting and navigating burdens, and even allowed the matured AUSS vehicle to be used for certain complex, fully autonomous functions. These included performing sonar search patterns covering several square nautical miles, and transiting long distances, without operator commands being sent for hours. An early AUSS hardware objective was to build a prototype system as a testbed for various types of sensors and methods of search, then smooth it out for delivery to the fleet as an operational system. This became clearly impractical. The prototype involved several emerging technologies applied together for the first time, and it was the first source of performance data for the approach taken. This level of RDT&E proved to require an evolution to upgrade the mechanical, electronic, acoustic, and computer capabilities of the prototype. Thus the AUSS developers had to design and field a prototype before they could realize the requirements for a deliverable system. But the results were far better than what could have been achieved in a single generation. Many essential enabling technology areas were matured with the prototype. With it, an acceptable approach to tailoring search sensors to the UUV search task was established, many system deficiencies were defined, and most were reduced to solvable engineering problems. A search demonstration with the highly compromised prototype showed that the AUSS concept was a feasible approach, and that the potential existed to significantly improve search by continuing the AUSS effort. The prototype was a product more of evolution than of its original system engineering. Post- design breadboard-level implementations existed throughout. Add-on vehicle wiring was a major contributor to electromagnetic interference with the onboard analog and digital communications. The signal-to-noise ratio in the acoustic link system was not acceptable. Transmissions of high-quality images through the acoustic link required so much time that the rate at which the system could search was below optimal. Some of the computer processing capabilities were tapped out, the hardware being several years and a generation old. The vehicle buoyancy system consisted of a pressure vessel providing less than adequate displacement supplemented by ad hoc, oddly shaped pieces of syntactic foam. The vehicle fiberglass fairings suffered from extensive modifications including holing, sawing, and gluing. Enter the improved system. Its ground up design based upon the prototype lessons paid off handsomely. The electrical and acoustic signal- to-noise ratios were excellent. The vehicle computer systems were expanded and upgraded to the best available technology, with processing capability to spare. Hard-to-change, contractor- supplied surface console software was rewritten and ported to a network of off-the-shelf industrial computers. Original image compression algorithms were developed so optical and sonar images were seen by the operator within seconds of acquisition, and the advance speed of the vehicle was optimized during sonar imaging for the travel time of the sonar pings. An important AUSS goal was to produce a small lightweight system that could be transported easily and placed upon a large cross section of ships of opportunity. As with any overall vehicle system, the size of AUSS depends heavily upon the weight and size of the undersea vehicle. If the vehicle is allowed to increase in size, the launch and recovery gear, the handling gear, and the maintenance areas grow in kind. There is also a vicious cycle of growth associated within the self-powered vehicle design. A larger vehicle requires more propulsion power requiring more energy for the same speed and endurance. More energy leads to more weight and volume in the energy source, which leads to a larger vehicle. Deep service syntactic foam is a much less efficient form of buoyancy than properly designed pressure vessels. Syntactic foam was used extensively on the AUSS prototype vehicle, as has been the case for many undersea vehicles. A commitment was made to avoid its use on the improved vehicle. To meet this objective, several measures were taken. Extremely efficient graphite pressure hull technology was developed with the prototype, and applied to the improved system. A 30 inch diameter graphite cylinder was manufactured to provide all of the buoyancy required for the improved vehicle. Other measures taken were the use of SpectraTM (which has a specific gravity very close to that of sea water) for the free flooded fairings, magnesium for the chassis inside the vehicle, titanium for the wet connectors, and titanium and aluminum for redesigns of various sensor housings. The commitment to relying solely on the graphite epoxy hull for buoyancy was met. The only syntactic foam in the system was the deployable nose float used for recovery. A major lesson learned was that a system such as AUSS must be developed interactively with the use of the ocean as a laboratory. From the beginning of the improved system sea testing until its final search demonstrations, operations provided catalysts for improved strategy, refined tactics, better software algorithms to relieve the operator of mundane tasks, and completely new methods for performing supervisory controlled search. Furthermore, only actual in situ experience can identify certain hardware component weaknesses or system deficiencies. In particular, the complex interactions between multiple acoustic devices and other potentially noisy subsystems on board cannot be ultimately proofed elsewhere, nor can the cumulative effects of sources of electromagnetic interference. The time required for signals to travel between the surface and vehicle is dependent on speed of sound in water and the distance between the two. Range of operation therefore affects the response time of the vehicle to supervisory commands, and it also affects the delay time taken for sensor information to reach the supervisor. These delays will increase with operational range, amounting to a round-trip delay of ten seconds or more at 20,000 ft depth with moderate standoff. The only way to prevent degradation of performance with range in an acoustically supervised system is to develop strategies which utilize vehicle autonomy. An example of more autonomy yielding better range insensitivity by the system is an approach developed during the AUSS interactive seatest/development process for viewing objects on the bottom of the ocean. Neither the prototype nor the improved vehicles had side thrusters, and hovering over an object in a current proved impossible. 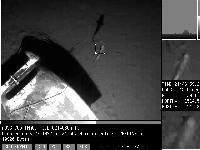 With the prototype, pictures of the object were taken while the vehicle glided over it at some forward velocity. The operator had to guess when to command the vehicle to take a picture. The combined acoustic link/supervisor reaction time increased with range to the vehicle. This process was marginally possible for ranges of 2500 feet, and would have been nearly impossible at the maximum range of 20,000 feet. During the improved vehicle evolution, an autonomous "hover at a radius" algorithm was implemented. This simple algorithm is analogous to a boat standing off from a buoy; the vehicle points at a position and maintains a given standoff from that position. The vehicle "weathervanes" into the current, but remains aimed toward the target object. If the standoff distance is selected to be equal to the distance between the imaging camera (at the front of the vehicle) and the Doppler sonar (which is aft of the camera and is used to determine the position of the vehicle), the camera stays over the target. This is a completely autonomous routine which is range insensitive and requires only one supervisory command to send the vehicle to a target. As the AUSS system became operational and more dependable, a number of other innovative supervisory control system advances were invented to simplify the supervision of the undersea vehicle operations. Among these was target marking, wherein the location of a target object in the vehicle's onboard navigation coordinate system is automatically calculated when a cursor is placed over its image. Target marking was applied to Side Looking Sonar (SLS), Forward Looking Sonar (FLS), and Cooled Charged Coupled Device (CCD) imaging portions of the AUSS mission. The synergy of hover at a radius and target marking made a significant contribution to the efficiency with which the system could view objects (targets) on the bottom. Each step in the target marking/hover at a radius sequence brings the AUSS closer to the objective target using successively shorter range, higher resolution sensing. A SLS target mark is used to determine a position for the vehicle to go to, hover at, and obtain an updated target mark with the FLS. FLS target mark is used to determine a position for the vehicle to go to, hover at, and obtain the first CCD image. 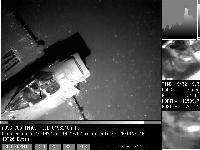 Finally, the cursor is moved about on the CCD screen to mark positions for the vehicle to go to and obtain CD image coverage of the target area. Word of the impending end to AUSS development funding was received on April Fools Day, 1992. This bad joke provided a good opportunity to obtain a snapshot of the system capability and for AUSS to "showcase" for a period of time. And showcase it did! 65 hours of bottom time were logged during 8 dives between 5 April and 24 June. These 8 dives produced some compelling results. During the showcase, SLS search rates were as high as 1.5 sq-nmi/hr, and contact evaluations (the process by which targets are found and imaged with CCD) typically took between 10 and 15 minutes (time between the operator's identification of a potential target on SLS, and the time when the vehicle was once again searching with SLS). Fully operational dives between 2500 and 12,000 feet, depth-independent supervisory controlled search tactics, and excellent compression-enhanced acoustic link performance to 12,000 feet, were all demonstrated. This is where it all came together. During a single dive at 4000 ft, consistent SLS search was conducted at speeds between 4.5 and 5 knots with a swath of 2000 ft. The area searched during the dive was 7.5 sq-nmi, and the time to conduct SLS search and contact evaluations was 8.5 hours. This demonstrated a SLS search rate better than 1.5 sq-nmi/hr and an overall search rate (including contact evaluations) of 0.9 sq-nmi/hr. In another 4000 ft dive, over 2.5 sq-nmi were searched, including several lengthy contact evaluations and three photomosaics (series of overlapped CCD images taken while the vehicle performs a small search pattern over a target area). 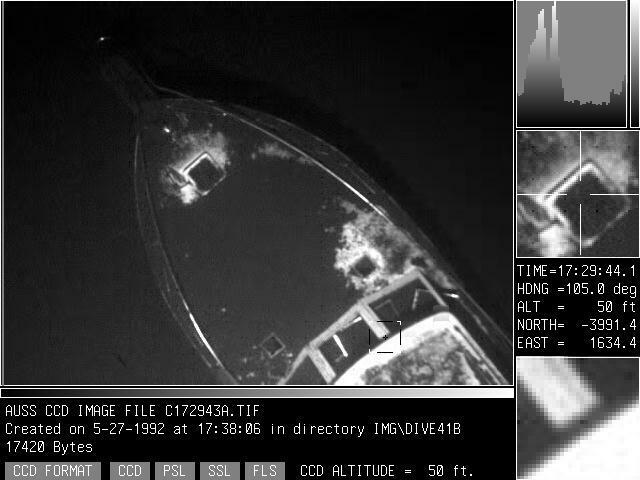 The contact evaluations included a 55-ft yacht ( figure 1) and a Korean War vintage Skyraider night fighter aircraft ( figure 2) which were both discovered and position pinpointed during the dive. An autonomous 5 nmi transit was also performed during the 14 hours the AUSS vehicle was submerged. The passenger compartment of a 1940 Oldsmobile was searched for, found, and inspected (figure 3) during a dive at 12,000 ft. The vehicle operated at 12,000 ft for 11 hours. 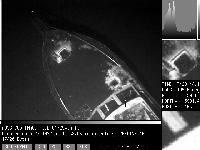 The images were compressed and transmitted through the acoustic link at 2400 bps. Communications during the 12,000-ft dive were excellent, and search and contact evaluation tactics were proven to be depth insensitive. Although years of study, research, and computer modeling preceded the fabrication of the prototype AUSS, capabilities and tactics are far better than originally conceived. The evolution of two generations of supervisory controlled search systems was guided by the lessons learned at sea. AUSS has been an able teacher. This technology is covered by U.S. Patents #5,018,114, 4,905,211, 4,432,079 and 4,418,404 and others assigned to the U.S. Government. Parties interested in licensing this technology may direct inquiries to SSC SD Legal Counsel.